Dark carmine colour. 14%. Floral nose, precision; tannic, rich, good extract and intensity, purity and expression. Epitomises the idea of CdR. Pure and wine-y, with a touch of oak. Long finish. 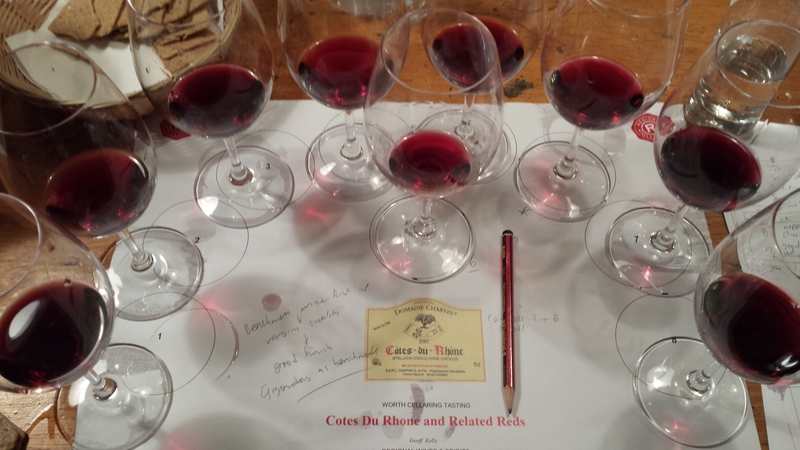 In September L and I attended a Côtes du Rhone: Worth Cellaring evaluation tasting with Geoff Kelly. He contends that for wine-lovers of average means, the wines of the Southern Rhone valley are the most appealing, food-friendly and affordable red wines on earth. In his opinion, affordable Aussie reds are too alcoholic, young, raw and oaky; too many cab / merlots are either unripe or too oaky; and good bordeaux and all burgundy’s simply too expensive, as are the better NZ pinot noirs. Reds of Spain and Italy offer good value, but are an unknown quantity to most New World drinkers. For Geoff, good quality CdRs are well suitable for the cellar, contrary to the views of some overseas winewriters who favour consumption within 3-5yrs over longer conservation. So, during the course of the tasting we tried blind 16 different CdRs – including Côtes du Rhone, CdR-Villages, CdR Named-Villages and odd wines from districts graduated to their own appellation i.e Cairanne. Chateauneuf-du Pape and Gigondas are the most noted so a couple of Gigondas wines were included in the hope that they set a benchmark. As further background to the tasting, we were told that the better Southern Rhone reds are made from blends which must include Grenache (min 40% and upwards) and the noble grapes syrah and mourvedre in the greater wines, and carignan and cinsault in the lesser ones. Such wines when not over-ripened are gloriously fragrant, and redolent of pink roses, Sweet William, carnations, thru dark roses to cinnamon and black pepper. 2010 – vintage with good ripeness and fine balance. The best wines will cellar very well. 2011 – generous crop in average temperatures. Commercial vintage. Some cellar-worthy wines. Dom. 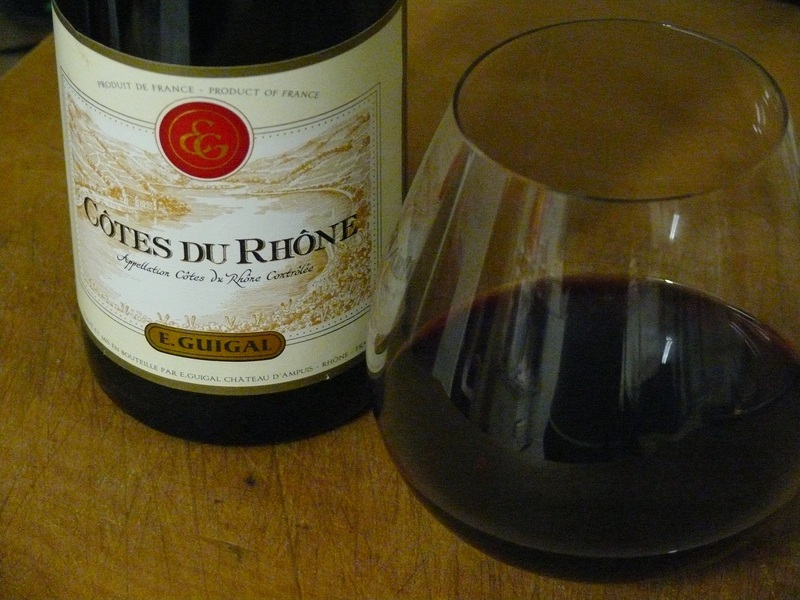 Guigal Côtes du Rhone 2010 – $$ – drink 2015-2020 – Dark carmine colour. 14%. Floral nose, precision; tannic, rich, good extract and intensity, purity and expression. Epitomises the idea of CdR. Pure and wine-y, with a touch of oak. Long finish. 2.6m litres made!. 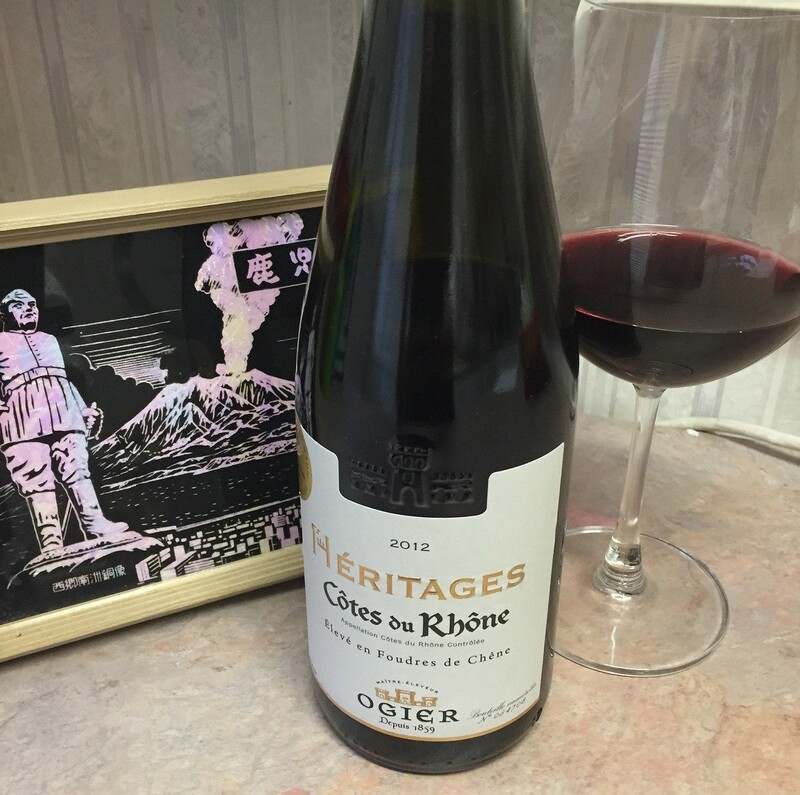 Famille Perrin Côtes du Rhone Reserve 2010 – $$$ – drink 2015-2016 – Dark carmine. 13.5%. Warm nose, floral. Soft in the mouth, with some spice. Correct depth and finish. Mellow and more substantial that other Rhones in the tasting, more ripeness and fruit weight. L liked this one. Dom. Des Espiers Gigondas 2011 – $$$+ – drink 2015 – 2020 – Dark carmine. 14.5%. Slightly funky (ha!) and reductive. Pleasing richness of fruit. Very deep, bags of flavour, spice, pepper. Long finish. Wonderful aromas of black doris plums – it truly ‘rests on it’s fruit’. Dom. Guigal Gigondas 2010 – $$$+ – drink 2016-2022 – dark carmine. 14%. A great nose. No words. Superb wine. Wonderful fruit, with cinnamon notes and cedar. Greater oak complexity in this wine, with stronger grip than others seen here. The last wine of the tasting, and what a finish! Greystone Pinot Noir Waipara 2012 – $$$ – drink 2016-2018 – This was the leading wine from the Under $30 Worth Cellaring NZ Pinot Noir tasting. Plaisir De Merle Chardonnay Western Cape 2011 – $ – drink 2016. The SA cheapie L and I have enjoyed a few of recently. Let’s see how well it sleeps-in.